Ridgid introduces its new 4.0 Ah Hyper Lithium-Ion Battery. With their new and improved chemistry, these 4.0 Ah batteries get up to four times the runtime of standard lithium-ion batteries. All Hyper Lithium-Ion batteries are built for high performance. They're protected from overheating, overloading, and overcharging through their triple protection electronics design. Their chemistry allows for maximum performance in temperatures as low as -4 and up to 120F. Tap into the confidence and flexibility of Bosch wireless charging. Create your optimal charging set up in between tasks, where you store it, or even as you drive between jobs. Be power ready, anytime, anywhere. The WC18C is compatible with all Bosch 18 V wireless charging batteries and includes an easy-to-read charge status indicator. Use it with the BC18F charger frame (included) or BC18H mobile holster for maximum flexibility. The DEWALT DCB090 USB Power Source is ideal for Charging Mobile Phones, Cameras, MP3 Players or other small electronic devices when AC Power is not available. This power source is small and compact but durable enough to withstand jobsite abuse. Backed by a DEWALT 3-year limited warranty for added peace of mind. The EGO POWER+ system boasts a revolutionary charging system. In just 40 minutes, a depleted 2.0 Ah battery can be fully recharged with the 56-Volt Charger. The active-cooling fan system supports rapid charging without overheating. The quick recharge capability ensures limited downtime with any battery in the EGO platform. 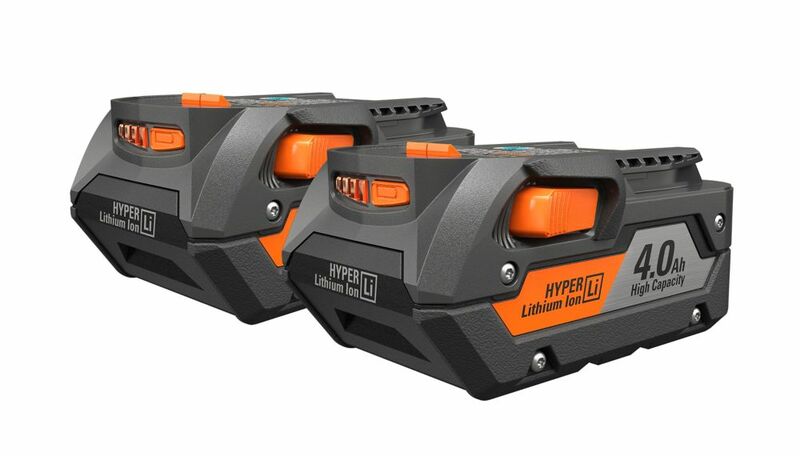 18V 4.0Ah Lithium-Ion Battery (2-Pack) Ridgid introduces its new 4.0 Ah Hyper Lithium-Ion Battery. With their new and improved chemistry, these 4.0 Ah batteries get up to four times the runtime of standard lithium-ion batteries. All Hyper Lithium-Ion batteries are built for high performance. They're protected from overheating, overloading, and overcharging through their triple protection electronics design. Their chemistry allows for maximum performance in temperatures as low as -4 and up to 120F. 18V 4.0Ah Lithium-Ion Battery (2-Pack) is rated 4.6 out of 5 by 1206. Rated 5 out of 5 by Greg from Power on the Go The larger batteries provide the necessary work duration when using a cordless router, impact driver and brad nailer. Best part is they are guaranteed fir life. Rated 5 out of 5 by Michael from Just whacked off all the branches on one side of... Just whacked off all the branches on one side of a huge fallen tree - with one battery on a saws-all. Amazing. Five stars!